Last year I had read on Jeanne Oliver’s blog that her family had a service advent tree. Instead of receiving a little gift or treat to count down the days until Christmas, they did an act of service for someone each day. I love the idea and thought I would try it this year. You could use any tree and attach stars on it each day but I thought I would make one. 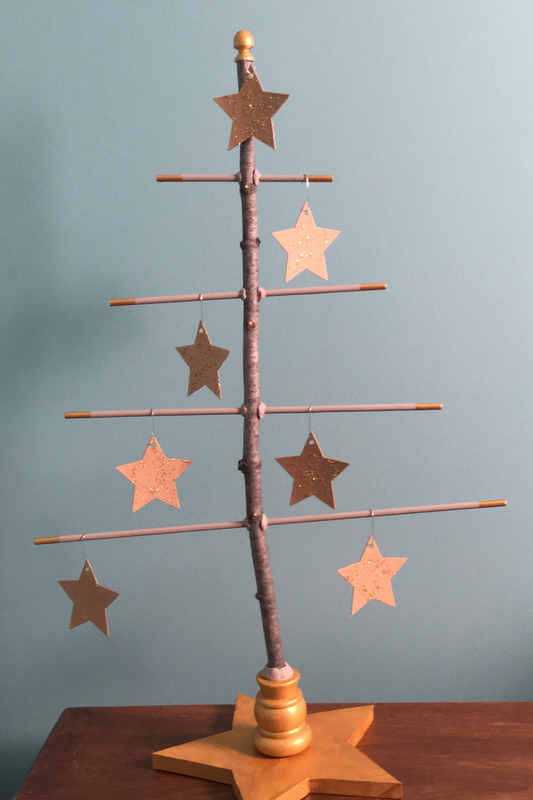 I found these wonderful kraft stars at Michaels. I did not want to completely paint them, but I wanted a little bling so I flyspecked them with two shades of gold metallic paint. I used DecoArt Metallics – Emperor’s Gold and Splendid Gold. I then brush the stars with white glue and sprinkled with Miss Mustard Seed Gold glass glitter for a little extra bling. If I did it again I would have done the glitter first and then flyspeck with the paint. The white glue took some of the luster from the flyspecking. I wanted a mix of natural and glitz so I cut a branch for the trunk of the tree instead of using a dowel. I then drilled the branch and placed dowels for the cross branches. My stars are 4 inches from point to point so that helped me determine the size of my tree. I used 1/4″ dowels and drilled the holes a little larger to give me some room to adjust the branches since the branch isn’t totally straight. I cut a star for the base out of 3/4″ lumber. I traced my kraft star and enlarged if for the pattern for the base. I used a candle stick from cupboard distributors to hold the tree trunk. I secured the trunk in the base using QuikWood. QuikWood is a two part resin, when mixed together can be molded and drys in 30 minutes. I filled in the base with the resin product then wrapped a roll around the top of it. I glued branches and then wrapped each side with a roll of QuikWood. Once resin is dry I painted the dowels a color similar to the branch (I used Pebble) and the star and base with Antique Gold. I then went over the gold with Emperor’s Gold. I painted Emperor’s Gold on the end of each dowel. I then glued the tree to the base. Once I was done I thought I needed something on top so a painted a small finial gold and glued to the top. Now that we have a tree we need to think about the acts of service that we can do for others. Below is a suggested list of things that you can do, but remember we each have different gifts and should use our gifts to bless others. Intentionally thank someone for what they do for you. You can also decide what would work for you and your family. You could write the different acts of service on the back of each star and pull one everyday or each day you could select something from your list. You could do the same thing each day during advent such as writing a note to someone. Choose what works for you, maybe it would be better to start with 12 days or once a week this year.